Malaria is one of the world’s most serious infectious diseases and affects more than 200 million people each year. Scientists at the University of Oslo have examined the bark from two African trees and found substances that can kill both the mosquitoes that transmit malaria, and the parasite itself. Traditional healers in West Africa have for many years used extracts from the bark of two trees in the citrus family (Rutaceae) to treat malaria, which is a widespread disease in the region and kills hundreds of thousands of people worldwide every year. Researchers at the School of Pharmacy at the University of Oslo in Norway have now shown that bark from the trees contains substances that not only kill the malaria parasite, but also the mosquitoes that transmit the disease. 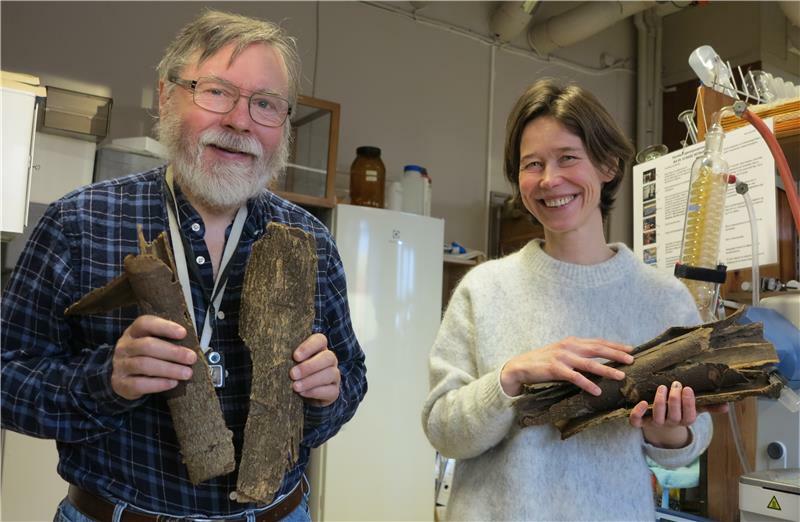 Karl Egil Malterud and Helle Wangensteen with bark from the african Olon tree, which contains chemicals that can kill both the malaria parasite and the mosquitoes that transmit the disease. “This project started in 2011, when we were approached by the entomologist Bertin Mikolo fra Marien Ngouabi University(link is external) in the Republic of Congo's capital Brazzaville. He had learned that local traditional healers were using extracts from the bark of a tropical tree to kill malaria mosquitoes and other insects, and he had demonstrated that the extracts could kill weevils and cockroaches. Now, he wanted Norwegian assistance to investigate whether the bark also contained substances that could kill malaria mosquitoes”, professor emeritus Karl Egil Malterud explains. Malaria is a disease caused by tiny parasites of the genus Plasmodium, which spend part of their life cycles in the blood vessels of humans and other mammals. The parasite is transmitted between humans during bites from mosquitoes of the genus Anopheles. To make a long story short: The scientists found several interesting substances both in the so-called Olon tree (Zanthoxylum heitzii) that is found from Cameroon to Congo, and in a related tree from Mali. The most interesting and active compounds were found in the Olon tree, but also the bark of Zanthoxylum zanthoxyloides from Mali contains active substances. “We produced extracts from the bark of the Olon tree and found that it contained at least one compound that kills the mosquitoes that transmit the malarial parasite. But the bark also contains another substance that kills the parasite itself”, says Associate Professor Helle Wangensteen. She has been the leader of this project. More than 30 species of the mosquito genus Anopheles kan infect humans with the malaria parasite. This is the species Anopheles Stephensi. Foto: Jim Gathany, Wikispecies/Centers for Disease Control. The scientists have been working with both water-based and alcohol-based extracts from the bark of the two trees, and it turns out that the extracts with alcohol contains more of the active substances. The substance that kills the mosquito is called pellitorine and was found in the bark of both trees, Malterud explains. 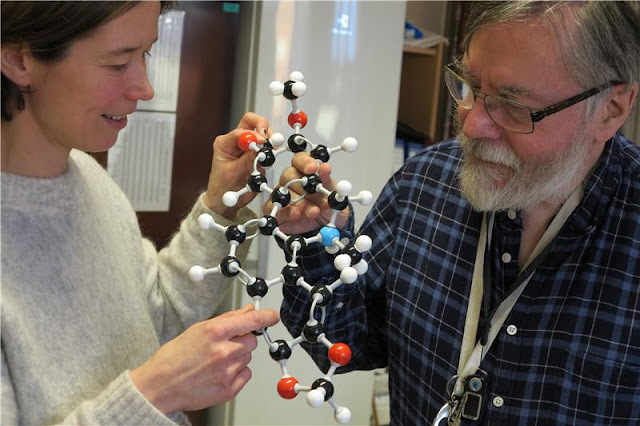 Helle Wangensteen and Karl Egil Malterud studying a structural model of the comparatively simple dihydronitidine molecule, found in the Olon tree and capacle of killing malaria parasites. “The Master student Nastaran Moussavi managed to isolate pellitorine and several other substances in extracts from the bark of the Olon tree. Later, she travelled to the French research institute IRD in Montpellier(link is external), in order to study their insecticidal effects. IRD has experts in cultivating the malaria mosquito Anopheles gambiae for scientific studies. Moussavi applied substances from the bark of the Olon tree to the neck of the mosquitoes, in order to investigate if the substances had toxic effects”, Wangensteen explains. “This caused the mosquitos to die, literally as flies! The experiments showed that pellitorine is toxic to mosquitoes”, Malterud adds. “We also found that a mixture of four main substances from the bark of the Olon tree had a higher toxicity than pellitorine alone, even if the other ingredients were not toxic separately. This suggests that there is a synergistic effect between the ingredients, says Wangensteen. At this point, Malterud and Wangensteen suspected that the Olon tree contained even more compounds with interesting effects. Then postdoc Ingvild Austarheim contacted the School of BioSciences at the University of Melbourne(link is external) in Australia, because they have a laboratory with experts on studying the malaria parasite. The scientists in Melbourne were interested in testing the new potential drugs, and it soon turned out that one of the ingredients was very effective in killing the parasite. “But this was not the same compound that killed the mosquitoes! The parasite-killing compound is called dihydronitidine and is a relatively simple alkaloid”, says Wangensteen. The Norwegian scientists had now shown that the bark of the Olon tree from Congo contains at least two interesting compounds: Pellitorine that kills malaria mosquitoes, and dihydronitidin that kills the malaria parasite. The researchers then went on to test the bark from Zanthoxylum zanthoxyloides, which is related to the Olon tree and is native to Mali. Professor emerita Berit Smestad Paulsen from the School of Pharmacy has cooperated for several years with healers from Mali, and they knew that the bark of this tree had been used in the treatment of malaria patients. “We found pellitorine also in the bark from this tree, in addition to several other interesting substances that have effects on the malaria parasite. But the effects were smaller than the ones we found in the extracts from the Olon tree”, Wangensteen explains. Both pellitorine and dihydronitidine are chemical substances that were previously known from other plants. However, the powerful effects against malaria mosquitoes and the parasites were little known before the Norwegian scientists started their work. Why isn't the industri interested? The scientists have published their findings continually, and you might expect that the international pharmaceutical industry would react with interest. Malaria infects ca. 200 million people every year, and there are major resistance problems with the drugs that are already on the market. There is an urgent need for new drugs – but the scientists have so far not been contacted. “I can imagine several reasons why we haven’t heard anything. One reason might be, to put it slightly maliciously, that the international pharmaceutical industry doesn’t always seem very interested in diseases that are mostly a problem in the "Third World." The second possible reason is that these findings have been published in scientific journals, which makes it more difficult to obtain patent protection for active substances”, Malterud suggests. “The third reason may be that the Convention on Biological Diversity(link is external) (CBD), which Norway and most other nations have ratified, stipulates that the rights to the commercial exploitation of biological material resides in the country of origin”, he adds. The pharmaceutical industry must always carry out extensive and expensive clinical trials before a new medicine can be approved, but there are so far no plans for such actions when it comes to the compounds found in the bark of the two African trees. That doesn’t stop Helle Wangensteen and Karl Egil Malterud from believing that their research can be used for the benefit of malaria-stricken patients in West Africa. “In the short term, it is realistic to imagine that our colleagues in Congo may communicate the new knowledge to the traditional healers in the region. It could be useful for them to know that the bark from the Olon tree contains active compounds that have effects against both malaria-transmitting mosquitoes and the parasite itself”, Malterud comments. “We can also contribute with new insights on how these substances can be used. For example, we discovered that water-based extracts contain relatively little of the active substances, whereas alcoholic extracts contain much higher concentrations. Perhaps it would be possible to spray the puddles where the mosquitoes hatch with a locally produced solution containing pellitorine”, he adds. All in all, the scientists at the School of Pharmacy tested more than ten compounds from the two African trees. In addition to the already mentioned compounds, it turned out that also the alkaloid heitziquinone, which was not previously known, has activity against the malaria parasite. Why do plants produce drugs? At least 30 per cent of the active ingredients in modern medicines are derived from ingredients found in plants. Why do plants produce compounds that are effective against human diseases? “We don’t know the answer to that question, but we can’t imagine that the Olon tree has any interest in killing mosquitoes or malaria parasites. But maybe the substances have an effect also on insects that for instance might feed on the trees”, Malterud suggests. “The primary function of many natural products found in plants is not known to science, but it's obvious that the plants use a lot of energy to produce these compounds. Therefore, it is hardly a coincidence that they are produced”, adds Wangensteen. The research on substances from the bark of two African trees was supported by the programme Functional Genomics (FUGE) in the Research Council of Norway, which had a commitment to bioprospecting. Nastaran Moussavi’s expenses for the work in Montpellier were funded by a grant from the Norwegian Pharmaceutical Society. Nastaran Moussavi et al. : Identification of chemical constituents of Zanthoxylum heitzii stem bark and their insecticidal activity against the malaria mosquito Anopheles gambiae. Parasites & Vectors, 2015. Helle Wangensteen et al. : A new benzophenanthridine alkaloid and other bioactive constituents from the stem bark of Zanthoxylum heitzii). Fitoterapia, Volume 109, March 2016. Christopher Dean Goodman et al. : Natural products from Zanthoxylum heitzii with potent activity against the malaria parasite). Malaria Journal, 2016. H0LiCOW: How Fast Is The Universe Expanding?